The construction materials industry is a major user of the world's resources. While enormous progress has been made towards sustainability, the scope and opportunities for improvements are significant. To further the effort for sustainable development, a conference on Sustainable Construction Materials and Technologies was held at Coventry University, Coventry, U.K., from June 11th - 13th, 2007, to highlight case studies and research on new and innovative ways of achieving sustainability of construction materials and technologies. This book presents selected, important contributions made at the conference. Over 190 papers from over 45 countries were accepted for presentation at the conference, of which approximately 100 selected papers are published in this book. The rest of the papers are published in two supplementary books. 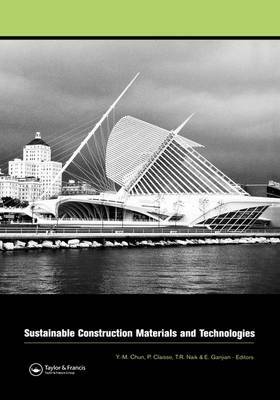 Topics covered in this book include: sustainable alternatives to natural sand, stone, and Portland cement in concrete; sustainable use of recyclable resources such as fly ash, ground municipal waste slag, pozzolan, rice-husk ash, silica fume, gypsum plasterboard (drywall), and lime in construction; sustainable mortar, concrete, bricks, blocks, and backfill; the economics and environmental impact of sustainable materials and structures; use of construction and demolition wastes, and organic materials (straw bale, hemp, etc.) in construction; sustainable use of soil, timber, and wood products; and related sustainable construction and rehabilitation technologies.